CRIVENS! 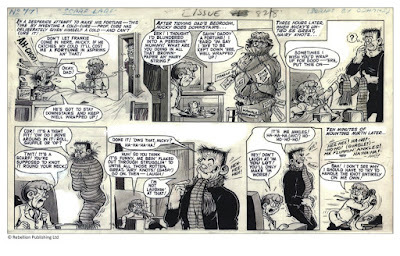 COMICS & STUFF: FRANKIE, FRANKIE, WHEREFORE ART THOU, FRANKIE...? You're looking at two pages of artwork that I once owned for many years. Before I parted with them, I had them professionally duplicated, actual size, at a printers in Glasgow. They're as close to the original art as it's possible to be, without actually being the original art. 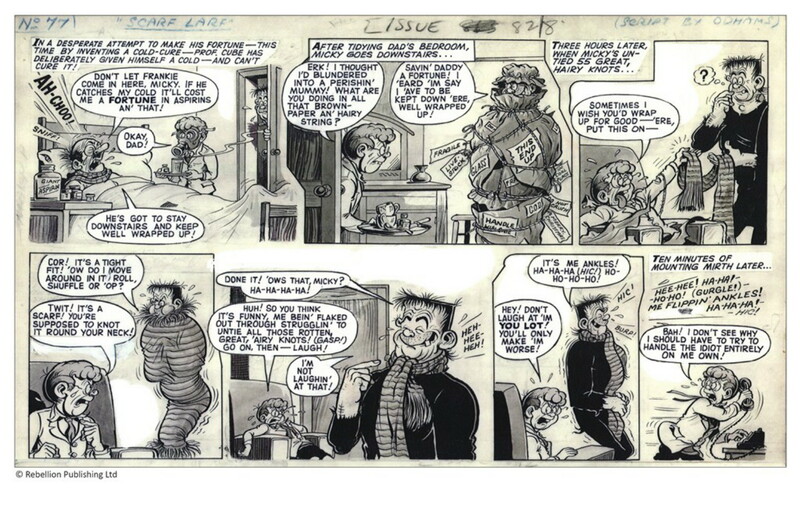 KEN REID generally drew each page in two halves, which were then joined together before publication in WHAM! comic back in the '60s. I generously supplied high quality copies of them (as well as a half page of The NERVS, the first one to feature Ken's hand-drawn masthead for the strip) to a part-time publisher to help him sell two volumes of Ken Reid's ODHAMS PRESS work, on the understanding that I would receive prints of whatever was used in promoting the product. As yet, the four half-page Frankie prints are outstanding, so I'm hoping this gentle reminder will prompt him to fulfill his obligation to me for providing the pages to him in the first place. You may be wondering why I want them if I already have the images in a larger size, but the answer is simple. "A promise made is a debt unpaid", and as I always pay my debts, I expect others to do the same with me. That's not too much to ask, is it? No, I didn't think so. Great images, eh? Are you a Ken Reid fan? Fell free to wax lyrical as to why in the comments section. 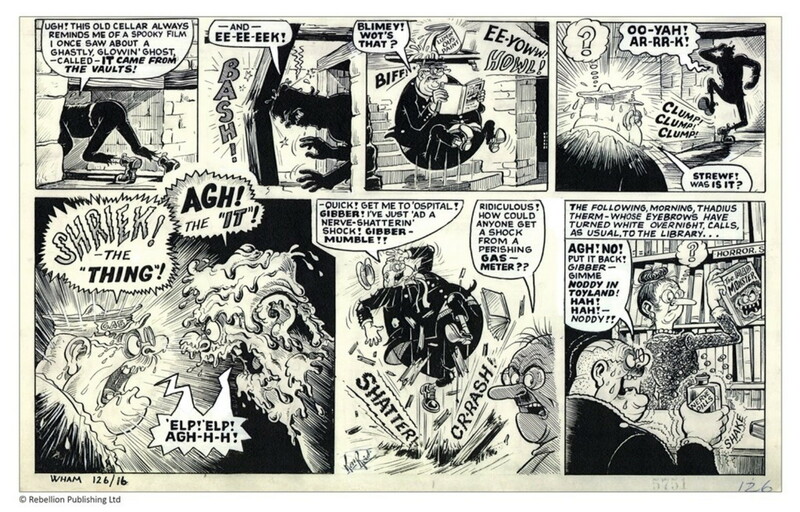 The first time I took note of Ken's work was the appearance of Jonah in 1958 in colour on the back page of Beano. The huge amount of detail as well as the great scripts made this the Dan Dare of the funnies, the must turn to page. 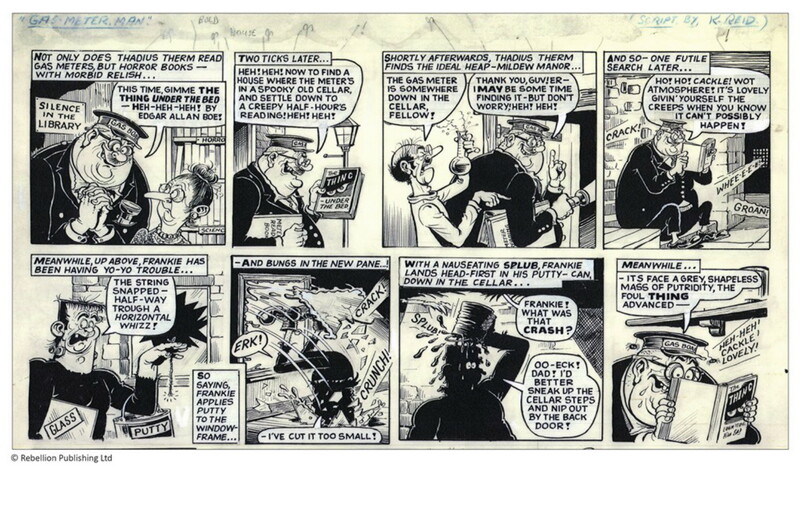 My first experience of his work was probably Roger the Dodger in The Beano and Big Head & Thick Head in The Dandy, T47, though the art never jumped out at me at the time. Frankie Stein in Wham! was probably the first time I really noticed his art, and even then I probably read the strip ignorant of just how well-drawn it was. My appreciation for the technical brilliance of his artwork came much later. All I knew at the time was that I liked it - couldn't have said why though. 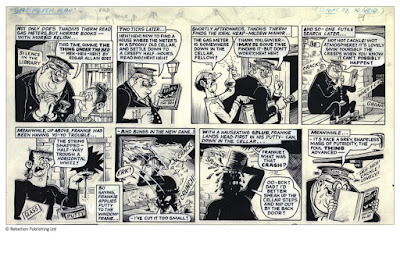 Around the time Jonah appeared in Beano copies of the American magazine MAD started to appear in limited numbers in London. The very detailed artwork that was the hallmark of MAD was reflected in Ken's work. Up until then Desperate Dan, Bash Street Kids etc where the most complex art but still far behind Will Elder and Jack Davies in MAD. I'm too lazy to check when Dave Berg's work first appeared in Mad, T47, but his style wasn't too dissimilar to Leo Baxendale's early work on The Bash Street Kids, and, as you say, Ken's work was extremely detailed. However, it's worth remembering that The Beano was aimed squarely at kids, whereas Mad (as a magazine) was aiming at an older, more sophisticated (but also bonkers) readership.